The William Blake Archive is pleased to announce the publication of electronic editions of America a Prophecy Copies B and I. Ten of the fourteen extant copies of America were printed in 1793, the date on its title plate. Copy I, now in the Huntington Library and Art Gallery, is from this printing. The eighteen plates of Copy I, like those of the other 1793 copies but unlike those of the later copies, were printed on two sides of the leaves, except for the frontispiece and title page (plates 1 and 2), and left uncolored. The plates were printed in greenish-black ink; five lines at the end of the text on plate 4 were masked and did not print, and plate 13 is in its first state. Copy B was printed in 1795 with copy A in the same brownish black ink on one side of the paper, with plate 13 in its second state. Unlike Copy A, however, it is uncolored except for gray wash on the title plate. Now in the Morgan Library and Museum, Copy B has a very curious history. Its plates 4 and 9, which were long assumed to be original, are in fact lithographic facsimiles from the mid 1870s produced to complete the copy. For a full technical description and history of this copy, see Joseph Viscomi, “Two Fake Blakes Revisited; One Dew-Smith Revealed,” Blake in Our Time: Essays in Honour of G. E. Bentley, Jr. Ed. Karen Mulhallen. Toronto: University of Toronto Press, 2010. 35-78. Copies B and I join six other copies in the Archive, Copies E and F (1793), A (1795), M (c. 1807), and O (1821), which altogether represent the full printing history of this illuminated book. 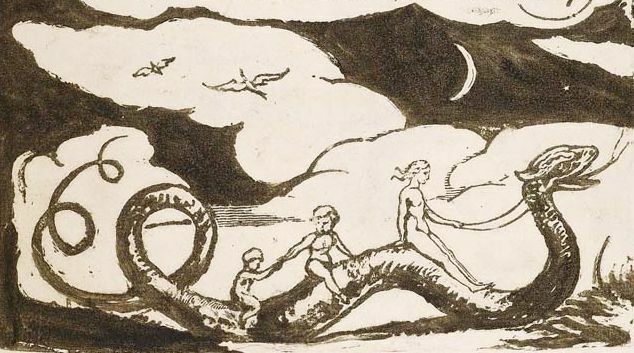 America a Prophecy was the first of Blake’s “Continental Prophecies,” followed by Europe a Prophecy in 1794, executed in the same style and size but usually colored, and, in 1795, “Africa” and “Asia,” two sections making up The Song of Los. Fine and important examples of all three books are in the Archive. Like all the illuminated books in the Archive, the text and images of America Copies B and I are fully searchable and are supported by the Archive’s Compare feature. New protocols for transcription, which produce improved accuracy and fuller documentation in editors’ notes, have been applied to copies B and I and to all the America texts previously published. With the publication of these two copies, the Archive now contains fully searchable and scalable electronic editions of 85 copies of Blake’s nineteen illuminated books in the context of full bibliographic information about each work, careful diplomatic transcriptions of all texts, detailed descriptions of all images, and extensive bibliographies. In addition to illuminated books, the Archive contains many important manuscripts and series of engravings, color printed drawings, tempera paintings, and water color drawings.